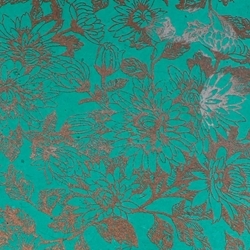 Metallic colors and designs jump off the page with screenprinted Lokta paper featuring a detailed floral vine pattern in sparkling copper and silver on bright turquoise blue paper. Nepalese paper artisans hand-craft Lokta paper out of fibers from the bark of the Lokta bush and then silkscreen the eye-catching designs onto the sheet. These 6" and 9" square packs make a unique option for origami foldings and other small projects. This neutral ph lokta paper starts with a bright turquoise base color and overlays a floral vine pattern of metallic copper and silver across the page. The paper fibers provide texture and angles for dramatic light effects creating a rich, opulent look.